Calculating the dimensions on both sides give the above equations. However, being isomorphisms of monster-representations we are not restricted to just computing the dimensions. We might as well compute the character of any monster-element on both sides (observe that the dimension is just the character of the identity element). 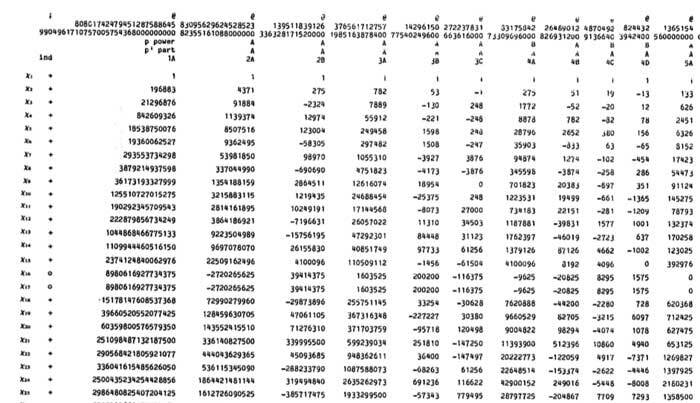 Characters are the traces of the matrices describing the action of a monster-element on the representation and these numbers fill the different columns of the character-table above. Hence, the same integral combinations of the character values of any monster-element give another q-series and these are called the McKay-Thompson series. John Conway discovered them to be classical modular functions known as Hauptmoduln. In most papers and online material on this only the first few coefficients of these series are documented, which may be just too little information to make new discoveries! Fortunately, David Madore has compiled the first 3200 coefficients of all the 172 monster-series which are available in a huge 8Mb file. And, if you really need to have more coefficients, you can always use and modify his moonshine python program.